The Indianapolis Colts have been one of the best teams in the AFC Conference for quite some time now and seem to dominate the AFC South division every single season, but this year they have really struggled to get back to championship form, especially on the offensive side of the football. Ever since the beginning of the NFL regular season the Indianapolis Colts have suffered injury after injury to some key players on offense and as a result four-time NFL MVP quarterback Peyton Manning has had a tough time getting the team back to the top spot in the AFC South division. Sign up for an Account Now at Bodog Sportsbook – Get ready for the Playoffs!! Without a doubt the biggest blow to this Indianapolis Colts offense this season was when perennial Pro Bowl tight end Dallas Clark went down for the year with a wrist injury that required surgery. Once Peyton Manning’s favorite target was gone, the offense is never really been the same as new receivers like Pierre Garcon, Blair White and backup tight end Jacob Tamme has struggled to pick up the slack. 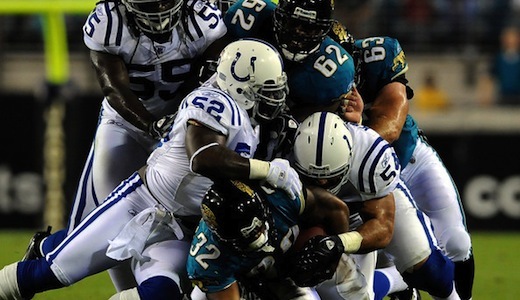 As a result the Colts struggling offense has really struggled to get back on track and Indianapolis will come into Week 15 with their backs against the wall as they will be facing the 1st place Jacksonville Jaguars in a must win situation if they want to make it back into the playoffs. With the Jaguars sitting at 8-5 and the Colts at 7-6, the only way Peyton Manning and company can hope to get back into playoff contention is by winning the AFC South division title and without a win in Week 15, their chances are pretty much shot. Obviously, the Indianapolis Colts are no stranger to must win situations or pressure like they will face this weekend on their home field Lucas Oil Stadium, but this may end up being the beginning of the end of their dominance within the AFC South. The only problem they will have in this matchup is that the Jacksonville Jaguars have played extremely well up to this point in the NFL regular season and finally have the dual threats of a dominant running game and a decent passing game. Bet the NFL Season With Bodog Sportsbook – Playoffs are close!! The one thing that the Colts defense will focus on more than anything this Sunday will be NFL MVP candidate running back Maurice Jones-Drew. Even though he hasn’t got the attention like Philadelphia Eagles quarterback Michael Vick or New England Patriots gunslinger Tom Brady, Jones-Drew has been as good as it gets this season and will look to prove that point this weekend in Indianapolis. As of right now, the Indianapolis Colts have been favorites come out on top in this AFC South division battle with a -4.5 point spread, but I have a feeling that there could be a huge upset here as the Jacksonville Jaguars finally seem poised to make a run at the playoffs and get the best of Peyton Manning and company.